Game Preview: Comets at Bears, 7 p.m.
04/13/2019 - Tonight, the Hershey Bears return home to Giant Center and play host to the Utica Comets, American Hockey League affiliate of the Vancouver Canucks. The match up will mark Hershey's last game against the North Division for the 2018-19 regular season. RADIO: WQIC-100.1 FM, Fox Sports 1460-AM, WOYK-1350 AM, Zack Fisch, the Voice of the Bears, Freddy Cassivi and Jim Jones on the call. 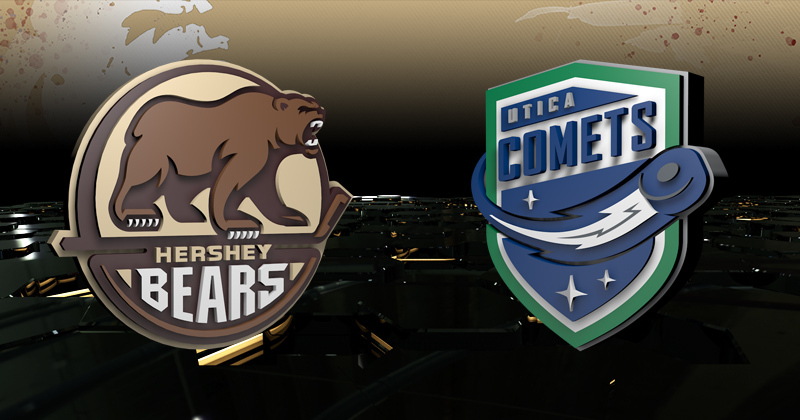 Both the Hershey Bears and Utica Comets are fresh off commanding victories the previous night. Hershey extended their XL Center winning streak to six games in Hartford after beating the Wolf Pack, 6-3. Steve Whitney and Nathan Walker both tallied twice, and Mike Sgarbossa wired home a first period power play goal for his 30th marker of the season. Vitek Vanecek stopped 32 shots to backstop the Chocolate and White to their 18th road win of the season. The Comets are coming off an 8-1 thrashing of the Wilkes-Barre/Scranton Penguins in Utica. The home team delighted its fans with a six-goal second period, with three courtesy of Reid Boucher. Hershey forward Mike Sgarbossa notched his 30th goal of the season last night, making him the tenth player in the AHL to hit that milestone. Sgarbossa's marker now gives Hershey two 30+ goal scorers, as Riley Barber has scored 31 goals, making the Bears only the second AHL team to accomplish this feat this season. Syracuse also has two 30+ goal scorers in Alex Barre-Boulet (34 goals) and Carter Verhaeghe (33 goals). The last time Hershey had two 30+ goal scorers was during the 2010-11 season when Brian Willsie and Kyle Greentree each had 30 goals. This is the first time Sgarbossa has scored 30 goals in his professional career, and he leads the Bears with 64 points. With 32 saves last night, Hershey netminder Vitek Vanecek earned his 20th win of the season, a new personal best. Vanecek now boasts a 20-10-6 record this season with a 2.67 goals against average, .905 save percentage, and two shutouts. Vanecek is the first Hershey goaltender to record 20 or more wins since Dan Ellis posted 25 victories for the Chocolate and White during the 2015-16 campaign. Vanecek has recorded 51 wins in 109 AHL appearances with Hershey. He has helped the Bears collect standings points in seven of his last eight starts. With last night's win, the Hershey Bears guaranteed a standings finish of at least 3rd place in the Atlantic Division. The Bears will battle the Bridgeport Sound Tigers in the opening round of the 2019 Calder Cup Playoffs. Although Hershey's first round opponent is certain, the Chocolate and White can still mathematically finish in 2nd place ahead of the Sound Tigers, claiming home ice for the playoff series. If Bridgeport earns at least one standings point, or the Bears lose at least one standings point in the remainder of the season, Bridgeport will win home ice advantage for the series. On Thursday, the Washington Capitals recalled goaltender Ilya Samsonov from Hershey to serve as the big club's third goaltender as they open the Stanley Cup Playoffs. In a corresponding move, the Bears recalled goaltender Adam Morrison from the club's ECHL affiliate, the South Carolina Stingrays. Morrison went 6-5-0-0 with South Carolina this season, posting a 2.87 goals against average and a .902 save percentage with one shutout in 12 games. Morrison signed an AHL deal with Hershey this summer, returning to the organization after signing a professional tryout and serving as Hershey's third goaltender during the 2017 Calder Cup Playoffs. His last AHL start came with the Providence Bruins on Nov. 11, 2014.